We bet you love hostas as much as we do! That is the reason for this important notice. In September 2014, Q&Z Nursery announced the closing of its doors. Why is this important? Q&Z Nursery was the last of the specialty hosta tissue culture labs left in America. There are still a few labs here that produce disease-free tissue cultured hostas, however the varieties they produce are very limited. These last few labs cater to the mainstream garden market and they mainly produce the common or best-selling classics. We can count on Mr. Bob Solberg to continue to introduce new and exciting hosta varieties for us to enjoy, but other than that the future of new & different hostas looks uncertain. Q&Z Nursery has been selling out its inventory of hosta liners for the past several weeks. For the next year or so most varieties will remain availabe. After that many hostas may become difficult to obtain. We strongly recommend that you add to your hosta collection those plants you have had your eye on, while plants are still available. It is possible that someone might start up a new tissue culture lab and grow & distribute new and exciting varieties. We are afraid that if Mark Zilis' Q&Z Nursery could not flourish imagine how hard it would be for a new operation to exist. Several years ago Q&Z's rival was Shady Oaks Nursery. Shady Oaks was sold to 3 different owners in a span of three years, before finally closing its doors about a year ago. Getting hostas from breeders overseas is not recommended. 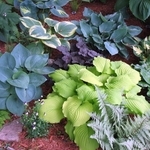 Imported hostas from other countries have had a history of problems, mainly the introduction and spread of Hosta Virus X. So what is the future of hostas? We will see a continued mass production of common varieties. All other varieties will become hard to find and when they are available they will be divisions of parent plants, a reproduction process that is very slow. Very low availablility will lead to prices soaring... GET THE HOSTAS YOU WANT NOW!